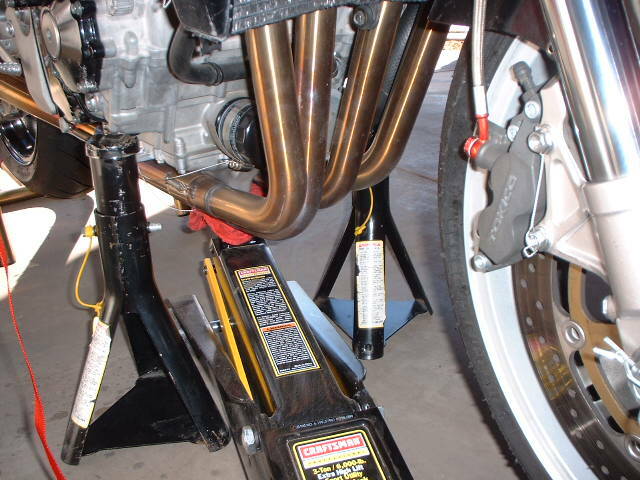 Note: This procedure was performed on a 2000 Suzuki GSX-R750. All specifications mentioned in this procedure apply to this model bike only. Please refer to your factory service manual for specifications regarding your bike. It is important that you read all steps in this procedure at least once before starting to work on your bike. Also, please keep in mind that there are many ways of performing these tasks. Feel free to make any change(s) to suit your circumstances. 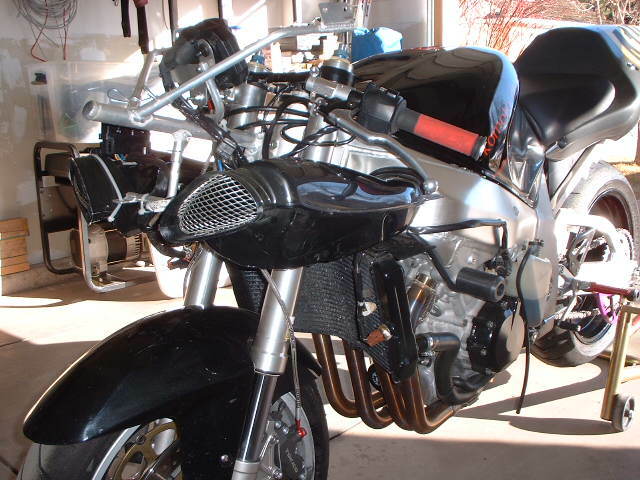 Step 1 Place the bike on rear/swingarm stand. Remove right and left, upper and lower cowlings. It is not necessary to remove the head light assembly. Remove both ram-air ducts. Step 2 Since the front wheel, fork and upper and lower triple clamps will be removed in this procedure, the bike will be supported on two jack stands placed towards the front. 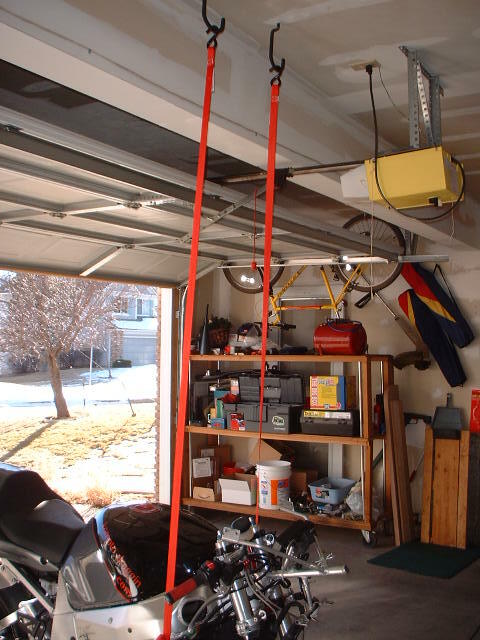 Two ratchet-type tie downs are used for additional support, as shown in this picture. Step 3 Hook one of the tiedowns to the upper motor mount on the right hand side. 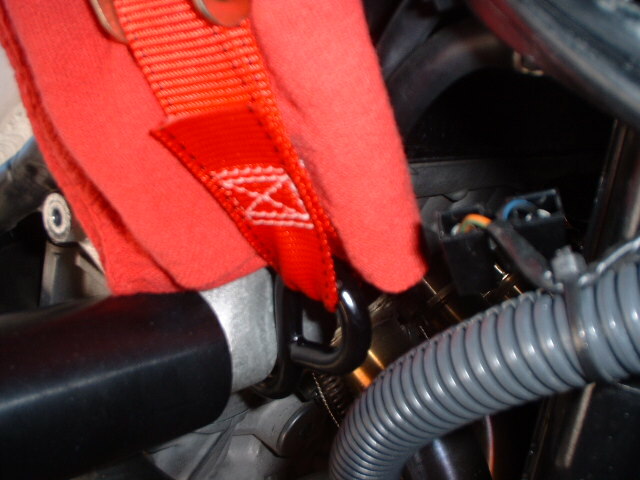 Place a rag between the tiedown strap and frame to prevent scratches. Ratchet the tie down to a snug position, making sure that excessive weight is not placed on the tie down. Step 4 Next, hook the second tiedown to the upper motor mount on the left side. 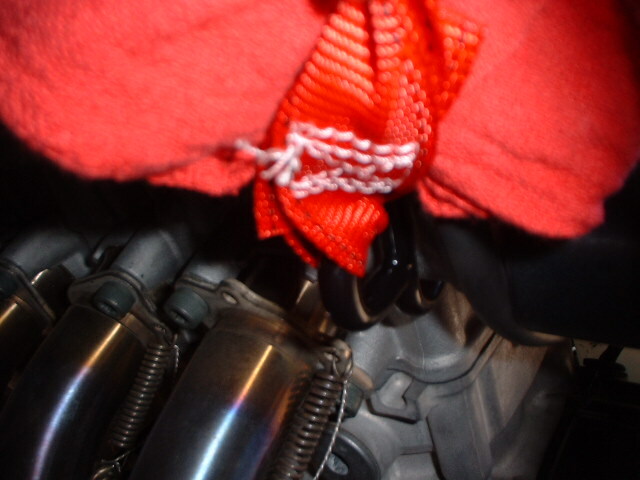 Place a rag between the tiedown strap and frame to prevent scratches. Ratchet the tie down to a snug position, making sure that excessive weight is not placed on the tie down. Step 5 Place two jack stands on either side of the motor. Carefully lift the bike in small increments using a floor jack, while simultaneously tightening the two tiedowns. 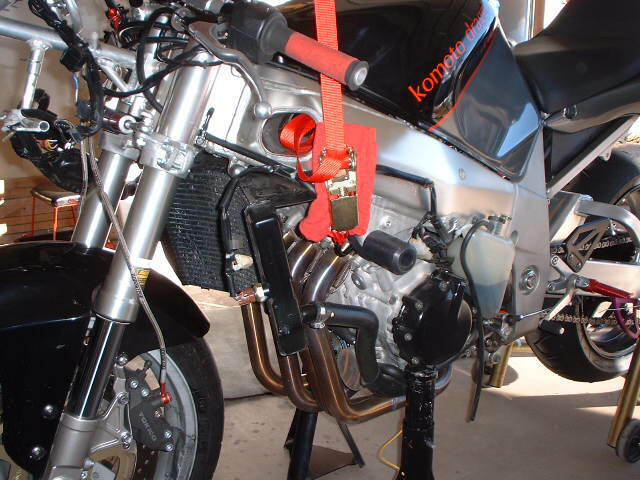 Place the jack stands under the motor when bike has been lifted to a sufficient height. 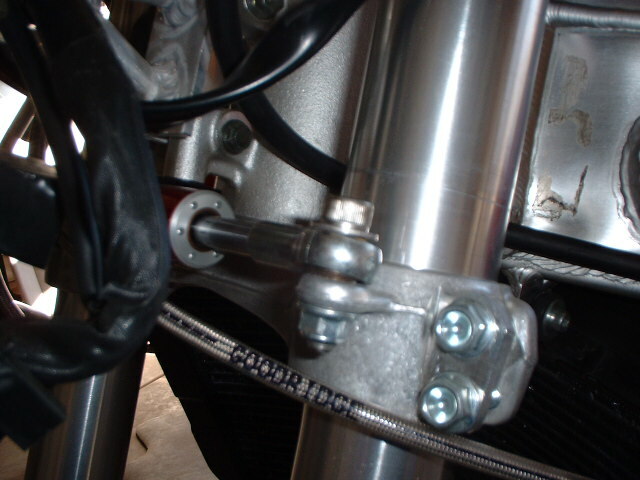 Step 6 Here, placement of the jackstand on the left hand side of the bike is shown. Once bike is secured, snug the two tiedowns again and remove the floor jack. Step 7 Remove the steering damper mounting bolt and nut on the left fork leg.